EVANSTON, IL The Chicago Force lost their first game of the season in a heartbreaking defeat to their arch rival the Boston Renegades. The weather conditions were awful throughout, with constant rain and winds gusting at 30 miles an hour. The elements seemed to affect Chicago more as they put the ball on the ground 11 times. Boston started out strong with a long return to Chicago´s 36 yard line. The initial drive continued and set the tone for the first half. Boston established their strong running game and scored on the opening possession on a short pass to the end zone. Boston extended their lead to 9-0 by blocking a Chicago punt attempt through the back of the end zone. After receiving the free kick on their subsequent possession, the Renegades added another score to go up 16-0. 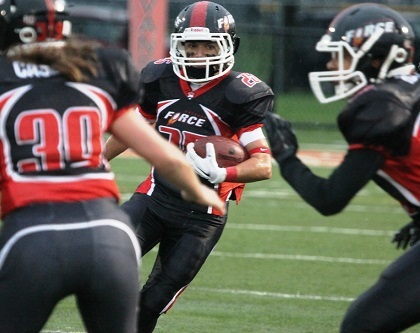 Chicago running back Cassey Brick was back on the field after being sidelined with an injury the past few weeks, and she provided the necessary spark for the Force. On her first carry Brick took a shovel pass and exploded for a 76 yard touchdown run late in the first quarter. The two point attempt failed as the Force cut the lead to 6-16. There was no further scoring in the first half. Head coach John Konecki seemingly found the right words during half time, as the Force came storming out of the gate. Rachel Gore finished a long scoring drive with a 9 yard dash to the end zone to make it a 12-16 game, as Chicago again failed to convert on the 2 point try. The Force captured the lead with 3:56 left in the 3rd quarter going up 18-16 on a 24 yard keeper by Gore. But again the 2 point attempt failed, leaving one with the nagging sense that this could come back to haunt the Force. With Chicago still holding onto the lead, Boston was forced to punt midway through the 4th quarter. The wind propelled the punt 30 yards past the returners. Brick chased it down and then headed back up field on an exhausting 89 yard touchdown return. And again Chicago failed to get the 3 yards necessary for the 2 point conversion and had to settle for a 24-16 lead with less than 9 minutes remaining. After an exchange of possessions Chicago drove to the Renegades 11 yard line and converted on a 3rd and 4 but were called for a false start. Chicago couldn't recover and then turned the ball over on downs. Starting from their own 14 yard line, Boston began to drive down the field. On 3rd down with 18 seconds left in the game, quarterback Alison Cahill threw a perfect sideline pass to Chante Bonds who exploited blown coverage for a 41 yard touchdown. Boston then converted on a 2 point attempt to tie the game at 24-24 with seconds remaining. Chicago was unable to return the kickoff and the game went into overtime. 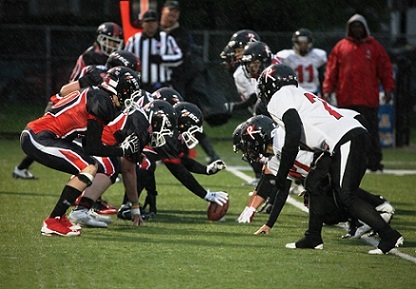 Boston won the toss and received the ball at Chicago´s 25 yard line. Chicago´s defense did a good job initially to stall Boston´s offense but could not hold. Boston benefited from some poor tackling and scored from the 8 yard line. A bad snap on the PAT left the score at 30-24. Chicago seemed out of sync and was unable to convert on their final possession. This was a devastating loss for Chicago, who survived an abysmal first quarter to score 4 unanswered touchdowns, only to give up the tying score on the final play from scrimmage in regulation. Brick was named the offensive game day MVP with 314 all purpose yards and 2 touchdowns. Gore threw for 183 yards and rushed for 68 yards and 2 touchdowns. Melissa Nelson was named the defensive game day MVP for her efforts, she led the defense with 6 tackles, including 3 for a loss. Chicago is now 5-1 and will travel to Indianapolis this Saturday for a divisional game. The next home game is June 13th versus St. Louis at Lane Tech Stadium, kickoff is at 5pm.